On the eve of Pabst announcement that their brewery would be sold for over 700 million dollars, we caught up with brewmaster Greg Deuhs to discuss his largest project of 2014- Ballantine IPA. During the interview, I was home in Chicago, Greg was at The Ballantine House, located at the Newark Museum in New Jersey. Here are some excerpts from that conversation. 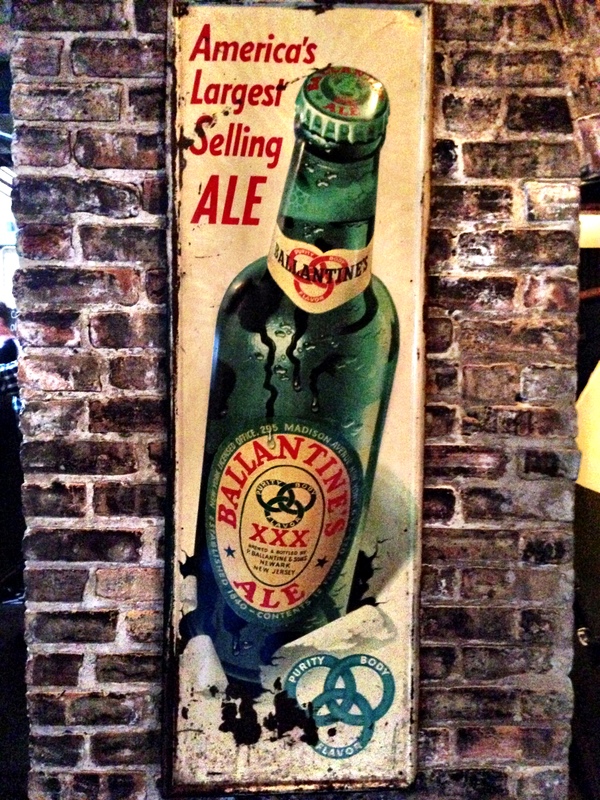 I was at Hopleaf recently and there’s a huge tin beer sign for the old Ballantine. That image, along your beer release gives us a chance to revisit America’s brewing heritage…I love this topic. When I grew up in St. Paul, MN many of the regional breweries were still very active – Hamms, Schmidt and Green Belt. Those breweries were in their heyday when my father took me on those brewery tours. Part of the draw for me working at Pabst is that we’ve got all these brands of beer from breweries I remember seeing when I was younger. Getting back to heritage is pretty cool for me too. Pabst is a national brand. You guys make beer all over the country, where was Ballantine IPA made? We brewed at Third Street Brewhouse in Cold Spring, Minnesota. That’s a brewery that we at Pabst have been associated with for a number of years. 3yrs ago they built a new brewhouse and fermenting cellar. They have a beautiful 75bbl brewery and a modern packaging line. They make a number of craft beers under contract like the cans you see from 21st Amendment Brewing, as well as their own brands. They’ve been a very good craft partner. What is this initial quantity of the IPA rollout? We’ve made 600bbls so far. That seems like a massive amount of beer. Outside of your core brands where does this rank for you? This is our biggest project for 2014..and beyond. We are in this for the long haul. Before joining Pabst I worked with Craft Brewers Alliance. I worked with Kona and Widmer Brothers. When I interviewed for the job with Pabst, one of the assignments was be prepared to discuss how Pabst can join the craft beer revolution. 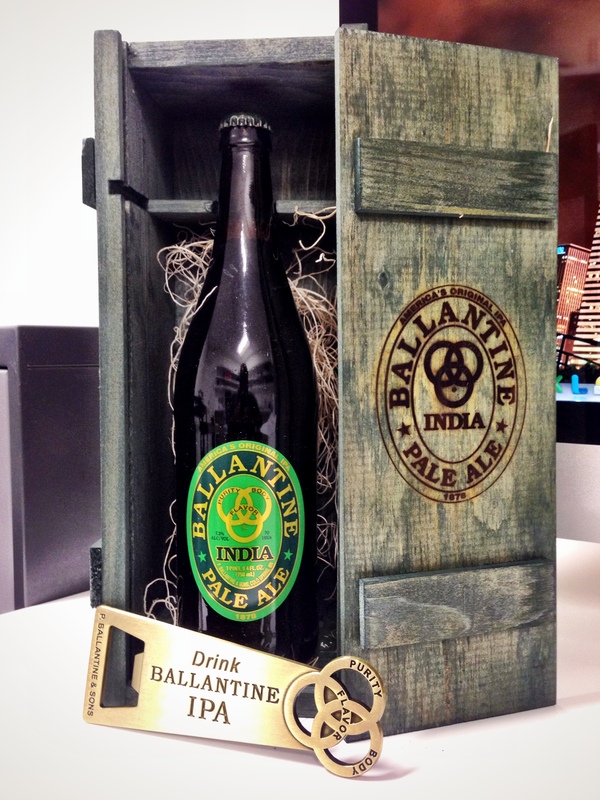 My presentation focused around how Pabst already had the answer – Ballantine India Pale Ale. We thought it was an excellent opportunity to launch a craft beer. Lets talk about recipe formulation. Was this a collaboration with Cold Spring? Cold Spring has an excellent brewing staff, the recipe formulation took place on the Pabst side. I began working on this behind the scenes for about a year on my own while the marketing and senior management teams were getting all their ducks in order. Finally they decided to explore it as a viable project. Through all the test recipes, I came up with 5 or 6 that best displayed the elements of what the Ballantine IPA was into those beers. From there we started hosting large tastings, we invited everyone in the company over to Milwaukee to try the beer. We then we took the recipe from 5-gallon size to the 75bbl size. I took all the brewhouse parameters on efficiency, kettle/ hop utilization and went from there to design what the production-sized recipe would be. From there it took 4 trial brews to tweak it with their equipment, and to understand utilization factors. It wasn’t a 1-to-1 linear build up from small scale-to-production, but it was close. The hopping was the biggest change. This packaging is really impressive, one of the best in recent memory. It arrived in a wooden box with a keychain. Is that how it will appear in stores? No. We only made 2000 of those boxes. They are generally designed for people like yourself, as well as distributors and key retail accounts. We’d like to find a way to make that available for the general consumer, We haven’t figured it out yet. The new label appears to be homage to the original. It’s almost an exact duplicate of the label used in the 50’s and 60’s. The tagline is different. It was ‘Aged In Wood For 1 Year’, we replaced that with ‘America’s Original IPA’. There was a change in the script, but the green label with the Borromean rings are identical. The original beer was made in Newark and also at the Rhode Island brewery until 1971 when Ballantine was sold to Falstaff. Later on Pabst acquired Falstaff, that’s how Pabst got the brand. The parameters of the beer we wanted to focus on were those from the 50’s & 60’s. The vintages from 1971-1996 were made at the Pabst’s Brewery in Milwaukee. That beer was 45 IBUs, and 6%ABV. It was more of a session IPA when compared to the one Ballantine made for over 100 years before that. This one is around 8% abv and near 80 IBUs. This is a beer that survived Prohibition. At one point it was one of that largest brands in the country and remained popular when many other beers couldn’t. Why is that? Yes, We were just talking about that very fact at the museum. When Peter Ballantine moved from Albany, NY back to Newark. He was very familiar with the influx of Europeans back in New York. He knew they wanted that type of beer and that they were familiar with it. That customer based drove sales and influenced the focus of the brewery. In 1939 the parameters of 7.8% abv and 75-80IBUs were the norm for this beer back then. What are your thoughts on the potential retro movement you’re creating within Pabst’s catalog? You have the ability to do this with a number of different beers. Just on the Ballantine side were looking at the Brown Stout, they also made a Bock as well as the Burton Ale which was highly regarded. I would like to bring out the Burton Ale as the true Barleywine Style Ale that is was. The portfolio is loaded with styles that would be known as craft today. For example, Pabst Andeker, a very good German Pilsner made in the Midwest is possible. There is Strohs signature brand which was a Bohemian Pilsner. Right now our hands are full with the Ballantine relaunch. But yes, we are starting to stoke the fire on what we can bring back. Ballantine Ale, Greg Deuhs, Pabst. Bookmark. I am 68 and today had a hankering for Ballantine Ale. Our local distributor was closed so I stopped a convenience store to see what might be available. To my surprise, ever lasting surprise, I saw 6 packs of Ballantine India Pale Ale and quickly grabbed several. In the ’60’s I loved Ballantine Ale and drank it regularly. On occasion I would grab a Pale Ale as it was a bit on the stronger hoppier side but nonetheless a great drink. In 1969 I interviewed for a sales job at the Newark plant but the company was spiraling and would shortly be sold to Falstaff. The Falstaff sale watered down the brew and the Pale Ale tasted like the original Ale. Distribution lessened and the brew became difficult to find. I had hoped to find it, but never would have expected it would be in a convenience store with a 3 door refrigerator, so I reached in and grabbed them quick. I love it and am glad to have found it, but the flavor is close to that of the original Ballantine Ale. As long as it’s available I’ll buy it. As far as selling the wood box intro gift bottle set with opener you can start right here and email with instructions how to purchase. You picked the right model of brew to enter the craft business with. Good luck. I am 66 years old and have fond memories of Balentine Ale and Balantine IPA form the 60’s and early 70’s. I lived in NY then nd the drinking age was 18. I was pleasently surprised to see the IPA in Consumer’s Retail in Lackawanna, NY. I bought a 6 pack. To my amaisment, it is exactly like I remember it. It has a licorice taste and very strong hop flavlor. This is not for the faint of heart. I am going back to by a 6 pack of Ballentine Ale to see if that tastes the same as I remeber it.